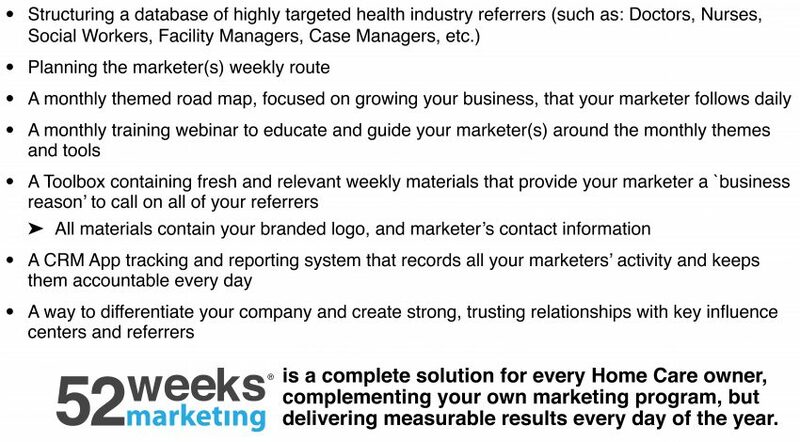 52 Weeks Marketing, LLC provides a unique `business-to-business’ (B2B) Referral Generating Home Care Marketing System, for those owners who are just getting started, to operators with well-established businesses. The program helps you set the course for the year, provides the tools, materials, methods and messaging for your marketer(s) with built-in CRM Software tracking and reporting you need to stay ahead of the game… 52 Weeks or the Year. Most of all, it helps your marketer develop the necessary relationships with those in your community who can refer clients and families to you. It gets your phone ringing and provides you with all the referrals and leads your business needs!